MPavilion, Sean Godsell Architects. Photo by Earl Carter. Australian architect Sean Godsell has designed the inaugural MPavilion, open to the public 7 October 2014 until 1 February 2015. The Australian landscape is a confusion of innate brutality and introduced refinement. Polite interventions early in our colonisation ‘civilised’ an otherwise harsh and often hostile environment where unfamiliar botanical species could poison and every bite and sting could kill. The indigenous landscape is ancient and its sunburnt beauty, once learnt, is never forgotten. Like the landscape itself it is scarred into the hearts and minds of Australians—it is part of us and we, of it. Any man made intervention in the outback symbolises shelter, respite, even salvation and the adaptive use of artifice underpins the tradition of building construction in this country. The introduced landscape design in cities like Melbourne provides contrast and relief, and in that relief exists another type of beauty—shade, autumnal colour, soothing lushness to offset the incessant dry. Order. Scale. Melbourne is a dense city that is counterbalanced by the vastness of its gardens. They nurture the city in an all enveloping green embrace and provide succour and comfort for all. In summertime our gardens are full of visitors who take advantage of the unencumbered accessibility that sets us apart—no fenced ‘resident’s only’ gardens, no ‘keep off the grass’ signs. Tourists and locals alike take advantage of the ring of green formed by Flagstaff, Treasury, Fitzroy and the Royal Botanical Gardens along with The Domain and our site—Queen Victoria Garden, which is directly across St Kilda Rd from the National Gallery of Victoria and on a busy pedestrian route to the CBD, Federation Square, the cricket at the MCG, tennis at Melbourne Park and live performances at the Sir Sidney Myer Music Bowl. As a tribute to the then monarch and in the capital city of the state that bears her name, the Queen Victoria gardens are certainly an example of an introduced landscape. In the style of the English picturesque period of the late 18th century they adopt the symmetrical asymmetry of Lancelot ‘Capability’ Brown, combining plane tree lined avenues with artificially constructed ‘hills and valleys’ There is a water feature, a monument and discretely located folly—a bandstand—that is framed by a plane tree allee and located atop a ‘hill’ at the southernmost end of the garden. A contemporary sculpture ‘The Pathfinder’ was added to gardens in the early 1970s. There is also a relatively level piece of lawn which directly opposes the NGV. With that axial connection and the city skyscrapers as a backdrop it is the obvious location for a temporary pavilion. 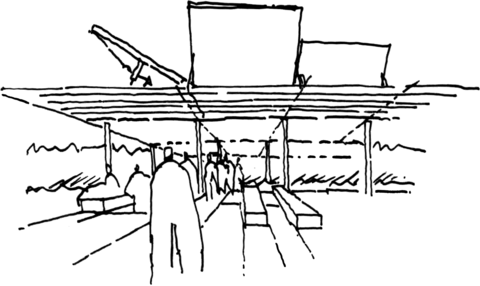 The purpose of the pavilion is to make a place over the summer months for recitals, presentations, lectures, readings and performances in a well-designed and nurturing shelter. The hay sheds and barns, shearers’ sheds and verandahs of the outback are Australia’s meeting rooms and community centres. We congregate in these rudimentary structures and host weddings, balls, meetings about impending drought or inevitable fire. They are potent places. The Melbourne Pavilion is a simple 12mx12m steel structure with glazed roof and fully automated outer skin. It provides shade and shelter and filters the harsh sun. Its precedent can be seen on distant hills and far horizons in the Australian outback. Sean Godsell with Naomi Milgrom. Photo by Earl Carter. Sean Godsell was born in Melbourne in 1960. He graduated with First Class Honours from the University of Melbourne in 1984. 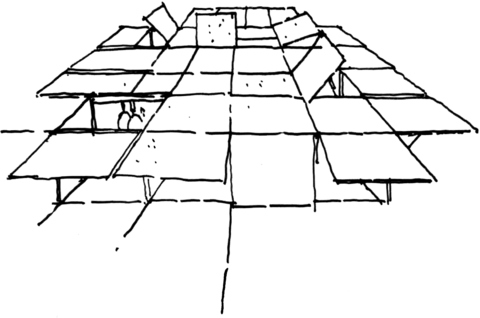 He spent much of 1985 travelling in Japan and Europe and worked in London from 1986 to 1988 for Sir Denys Lasdun. In 1989 he returned to Melbourne and worked for The Hassell Group. 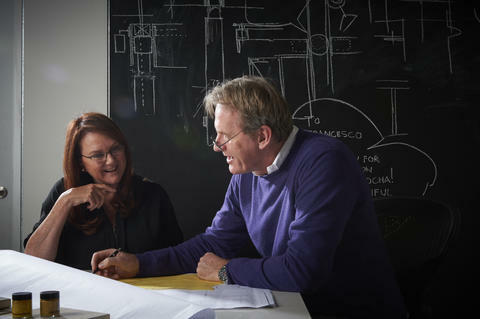 In 1994 he formed Godsell Associates Pty Ltd Architects. 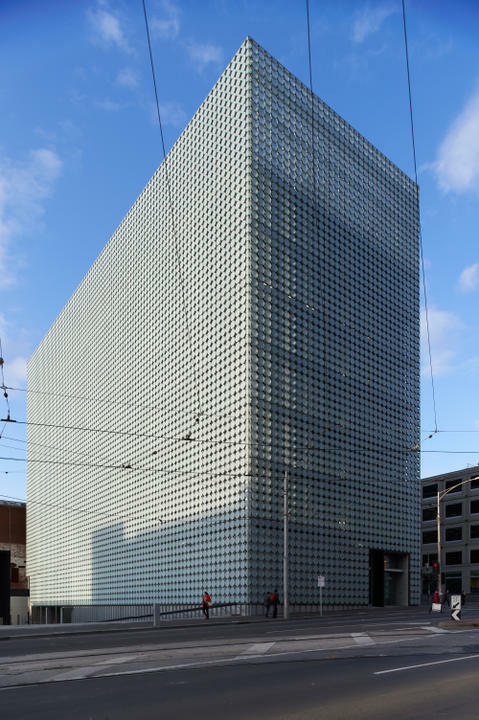 RMIT Design Hub, image courtesy Sean Godsell Architects. He obtained a Masters of Architecture degree from RMIT University in 1999 entitled ‘The Appropriateness of the Contemporary Australian Dwelling.’ His work has been published in the world’s leading architectural journals including Architectural Review (UK), Architectural Record (USA), Domus (Italy), A+U (Japan), Casabella (Italy), GA Houses (Japan), Detail (Germany), Le Moniteur (France), and Architect (Portugal). In July 2002 the influential English design magazine Wallpaper* listed him as one of ten people destined to ‘change the way we live’. He was the only Australian and the only architect in the group. He has lectured in the USA, UK, China, Japan, India, France, Italy and New Zealand as well as across Australia. He was a keynote speaker at the Alvar Aalto symposium in Finland in July 2006. In July 2003 he received a citation from the president of the American Institute of Architects for his work for the homeless. 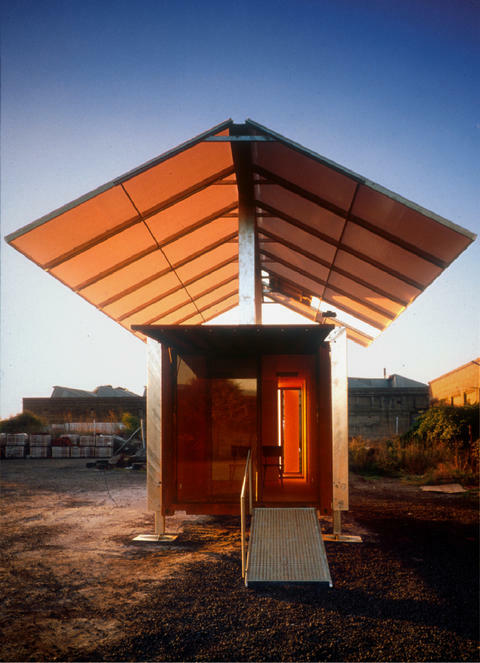 His Future Shack prototype was exhibited from May to October 2004 at the Smithsonian Institute’s Cooper Hewitt Design Museum in New York. In the same year the Italian publisher Electa published the monograph Sean Godsell: Works and Projects. TIME Magazine named him in the ‘Who’s Who—The New Contemporaries’ section of their 2005 'Style and Design' supplement. He was the only Australian and the only architect in the group of seven eminent designers. 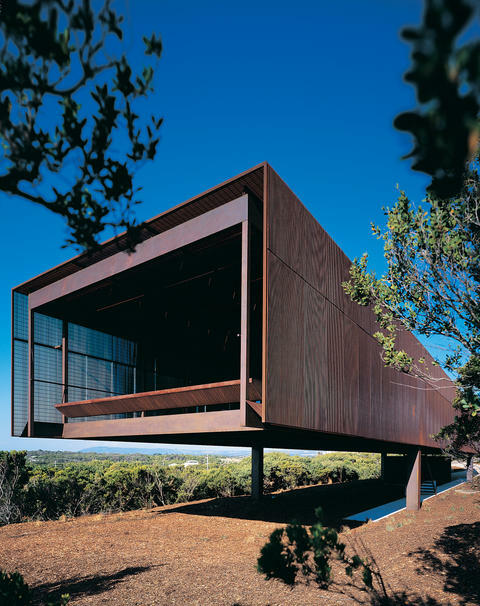 Future Shack, image courtesy Sean Godsell Architects. He has received numerous local and international awards. In 2006 he received the Victorian Premier’s Design Award and the RAIA Robin Boyd Award and in 2007 he received the Cappochin residential architecture award in Italy and a Chicago Athenaeum award in the USA—all for St Andrews Beach House—and in 2008 he was a finalist in the Wallpaper* International Design Awards and a recipient of his second AIA Record Houses Award for Excellence in the USA for Glenburn House. In 2008 noted architectural historian and professor of architecture at Columbia University Kenneth Frampton nominated him for the inaugural BSI Swiss Architecture Award for architects under the age of 50, and his work was exhibited as part of the Milan Triennale and Venice Biennale in the same year. In 2010 the prototype of the RMIT Design Hub facade was exhibited in Gallery MA in Tokyo before being transported in 2011 to its permanent home at the Victoria and Albert Museum in London. In 2012 he was shortlisted to design the new Australian Pavilion in Venice. In 2013 he received the RAIA Victorian Medal and William Wardell Awards for the RMIT Design Hub and the Harold Desbrowe Annear award for the Edward Street House. In January 2013 the Spanish publication El Croquis published the monograph Sean Godsell – Tough Subtlety which includes an essay by Juhani Pallasmaa and interview by Leon Van Schaik. In July 2013 and July 2014 he was visiting professor at the IUAV WAVE workshop in Venice and delivered the UNESCO chair open lecture in Mantova, Italy. For a full list of Sean Godsell's projects, please refer to seangodsell.com. St Andrews Beach House, image courtesy Sean Godsell Architects.